You know it’s not your usual bookstore when store manager John Fuller answers his phone and starts speaking Japanese. 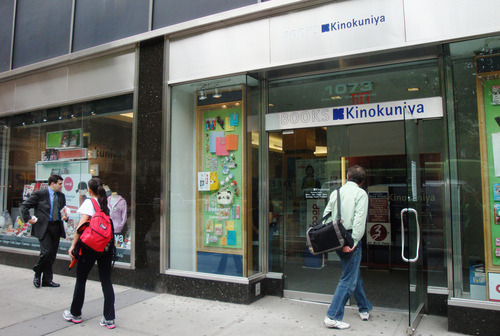 And it’s not just John: all employees who work at Kinokuniya, Japanese native or not, are fluent in the Asian language. Impressive! But you don’t need to speak Japanese to buy at Kinokuniya, because they’ve got lots of English books, too, including translations and English literature. I sat down with John last week to find out more about this welcome addition to the park’s retail landscape. This Japanese bookstore moved to Bryant Park from Rockefeller Center a few years ago, and is one of only two on the East Coast (the other is in West Nyack). Kinokuniya is also Bryant Park’s retail partner for the Word for Word series at the Reading Room, so you’ll be able to find any of the books featured in our series at the bookstore right across the street. It wasn’t the store’s hugely popular manga comics that first drew me in, but the stationery department on the lower level. Warning: give yourself some time, because it’s full of fabulous gift items, including plenty of Hello Kitty and even little stuffed characters from the world of Miyasaki, the great Japanese animator. And Kinokuniya also houses a popular Midtown lunch destination, Cafe Zaiya, where you can get not just bento boxes but also sandwiches like paninis. A list of topsellers at Kinokuniya is below. If you’re interested in the fashion magazines, call ahead because they sell out fast. And the Japanese art publication KIE arrived a few weeks ago, so buy yours soon as it, too, goes quickly. Little lined notebooks that sell for $1.40! John says they’re difficult to keep in the store, so now they order plenty to fulfill the big demand. 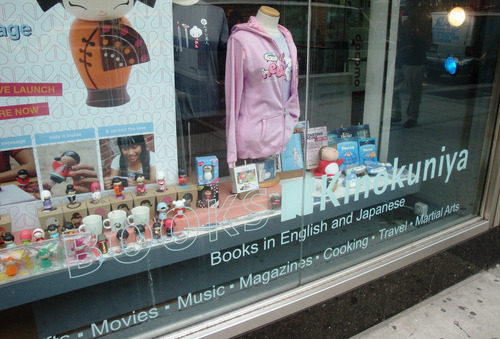 Thanks to John Fuller, Manager of Kinokuniya, for talking with us about this great bookstore! Shop Bryant Park is written by Fashion Herald’s Tricia Lewis.